The Footman James Sywell Classic Pistons and Props motoring festival are now taking entries from historic racers wishing to drive on the ‘Racing Runway’ and ‘Sprint Strip’ at this years event held at Northamptonshire’s Sywell Aerodrome on Sat 27th and Sun 28th September. Quoted as the ‘surprise hit of the 2013 classic motoring calendar’, the inaugural pistons and props festival saw a varied grid of pre-war to Formula 1 single seaters, sports cars and saloons participating in a demonstration run under clear blue skies and brilliant sunshine. For the pistons and props festival weekend, Sywell Aerodrome’s taxiway is transformed into the ‘Sprint Strip’ where dragsters and motorcycles burned up the tarmac. The mile-long main runway, with its smooth surface and high grip concrete, became the circuit with a right hand bend, long straight with midway chicane and 180 degree hairpin before a flying finish. Each car taking part in the demonstration, which is run in accordance with MSA requirements relating to sprints and hill climbs, gets two runs per session, with two sessions per day. There is also evening refreshments and entertainment. Classic motoring clubs, companies and traders interested in exhibiting at Sywell Classic can contact Live Promotions on tel: 01775 768 661 or email: info@livepromotions.co.uk. 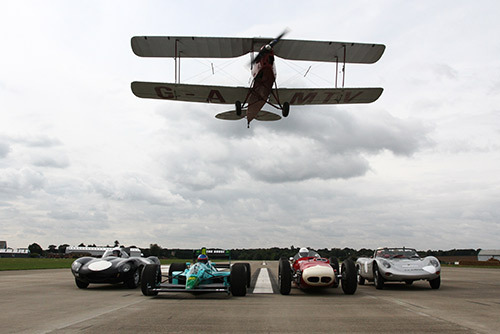 To book tickets and for the latest updates, visit www.sywellclassic.com. It appears so Tony, please see contact details at the bottom of the page. Are you taking your own car?